The Prospect Park: Can you top this? 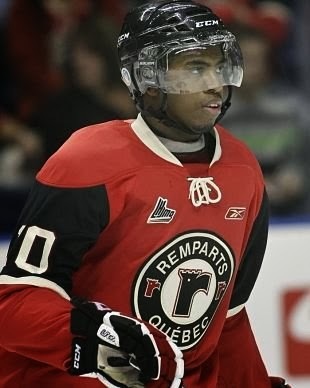 On Monday Adam Tambellini (NYR 2013 3rd 65th) had himself a 4 point game (1-3-4) so on Tuesday it was Anthony Duclair (NYR 2013 3rd 80th) who had himself a 4 point game as he helped his Quebec Remparts defeat the Blainville-Boisbriand Armada 7-5. It was more than just the 4 points here for the Remparts as it was a win over the team that is currently sitting in first place overall in the QMJHL. The Remparts have been struggling as of late against the top two teams in the QMJHL which is going to be a big reason why the Remparts won't earn one of the top 3 seeds come playoff time. But having a 4 point game against one of the better teams in the QMJHL does go along way in validating Duclair's season. When you are 50-48-98 with 10 regular season games to go then it isn't whether Duclair will break 100 points but rather how high will he go. Against the Armada, Duclair played playmaker helping the Remparts get on the scoreboard after spotting the Armada an early 2-0 lead. Duclair got the primary assist on Fabrice Herzog's power play goal at 8:39 of the first period. After the Armada would score to make it 3-1, Duclair would add a secondary assist again on the power play to cut the lead to 1 goal at 3-2 in the 2nd period. With the score tied at 5-5, Duclair would add assist number 3 when he was credited for a secondary assist on Mikhail Grigorenko's even strength goal at 16:40 which gave the Remparts the lead they would not give back. Duclair's 4th assist was also at even strength and also a secondary assist on an empty net goal at 19:58. A 4 point game is a 4 point game and for Duclair this was the 6th time this season that he register 4 or more points in a game. These numbers 15-29-44 are strong enough Ranger fans a reason to hope that Duclair makes it to the NHL as those are his numbers on the power play. Now toss in Adam Tambellini's 9-9-18 in just 19 games and all of a sudden there is some serious reason to hope that these two prospects make it to the Rangers. On Wednesday it will be Tambellini's turn once again so wonder what he will do against Moose Jaw?